There's nothing more emblematic of the Holiday seasons than the cozy feeling you get waking to a fire and conifer brimming under with presents. That feeling of togetherness and warmth and holiday spirit shared while singing songs of the season with friends and family. That feeling of turning Santa's Biplane into a killing machine to use against three of your closest friends. Ah, such memories! Move over, Red Baron, Santa is here, and he's packin'! 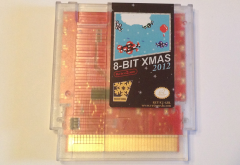 With 8 BIT XMAS 2012, you can invite three of your best (or worst!) 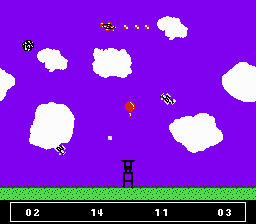 friends for a day of high-flying 4-player armed-to-the-teeth biplane-riding shoot-em-up fun! If you just want to play the game, here is a free ROM download! Load it up on your PowerPak or favorite emulator and destroy your friends. You will be sad you are missing out on the amazing blinky lights that flash when your opponent gets hit!